In our previous article How to choose a SEO-friendly domain name, we talked about how one important key to a SEO friendly domain name is branding. In this article, we will look at another way your domain name affects your SEO efforts and search results: keywords. 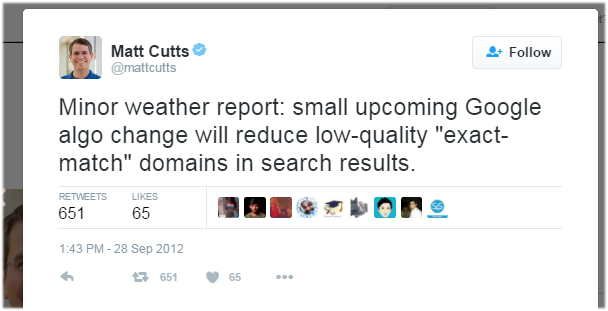 Ever since then, the weight Google gives keywords in domain name has declined. In fact, nowadays, it is well know in the SEO community that exact match domain names will be penalized by Google as well as Bing if the website doesn’t have high-quality content to back it up. Can I still use keywords in my domain name? Yes but sparingly. Note that keyword domains aren’t necessarily a must for every business or company, and not all keyword domains are created equal. Keywords play an important role when it comes to getting traffic to a website. Users type enter keywords into their search queries and they are more likely to click on domain names and links that contain those keywords. But keep in mind that Google is big on user experience – that means the keywords in your domain name need to be relevant and consistent with your website content. In other words, you should consider registering keyword domains that align with your website or business focus. We have all heard of the term keyword stuffing. It refers to web pages that are artificially inflated with keywords. Keyword stuffing also applies to domain names, so you need to be careful which keywords to use and make sure you have high quality website content to back it up. How should I choose which keyword(s) to use in my domain name? First and foremost, the keyword needs to be relevant and consistent with your website content and aligns with your business focus. When keywords flow well together. It is important that the keywords you use are actually searched for by users. They should be in the right order, not randomly thrown together. A good tool to use is the Google AdWords keyword tool. When you keywords flow logically, your domain name becomes memorable. You don’t want to settle with a domain name that is long and convoluted just because it contains all your target keywords. Such domain names are hard to remember and people won’t be able to type it into their web browsers. But it shouldn’t be your only keyword, unless your brand name is already so well-established and promoted that people recognizes it immediately (ie. Amazon, YouTube, Google). Start with your brand name and pair it with a good keyword. For example, if your name is Bob and you run a guitar repair service, a good domain name can be BobsGuitarRepair.com. You should only use a keyword if it makes your domain name more intuitive. For example, if you sell watches, you might want to consider a domain name like BobsWatches.com as it tells users your brand name as well as what your business is about. On the other hand, a domain name like BuyWatchesOnline.com would be too keyword-rich that it sounds rather spammy. Just as you wouldn’t keyword-stuff your brick-and-mortar shop sign, you shouldn’t keyword-stuff your domain name. Try to keep the number of keywords in your domain name to 2 or 3 and make sure only use keywords that are essential. Domain names with hyphens are often associated with spam websites – it is a tactic that early spammers used to trick search engines. But what if I am already using a keyword domain name or the keywords are part of my business/brand name? If you already have a keyword-rich domain, content will be your savior. In a Google Webmaster Help Hangout, Google’s John Mueller said that exact match domains do not necessarily mean it’s a bad website because there are plenty of examples where users have great experiences at keyword domain website because they are high quality websites. So, the key is high-quality content. Content should be original, informative, useful, interesting and media-rich. If you are starting a new domain name, you want to choose one that matches your brand instead of one that is an exact match for the keywords you are targeting. Only add keywords to your domain name if it sounds natural and matches your brand name. Do people actually search these keywords? Will these keywords make my domain name memorable? And if it ever becomes a either-or situation, focus on a domain name that is memorable and creates a brand for your business. If you can get a keyword or two in it, that’s great. If not, it’s not a big deal because a domain name is only a small factor in your SEO and search ranking.